Ferrari has just celebrated its 70th birthday in Maranello and fifty members of Ferrarista made the trip for the occasion. Half went on a five-day trip organized by Ferrarista. So what did you have access to? Was the trip worth it? What did the members of Ferrarista have seen? What could Ferrari owners see from this anniversary? 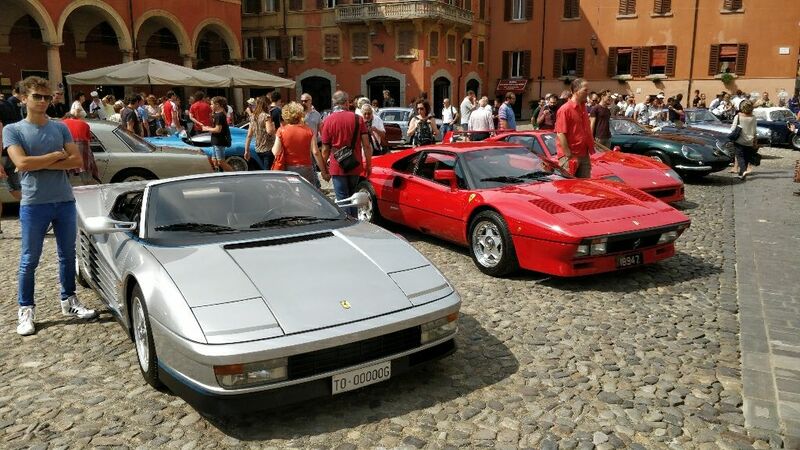 Ferrari had organized a rally from several major cities in Europe. But we decided to go directly to Maranello to make the most of the festivities there ... and to make some complementary visits (Pagani, Maserati, Lamborghini, etc.). 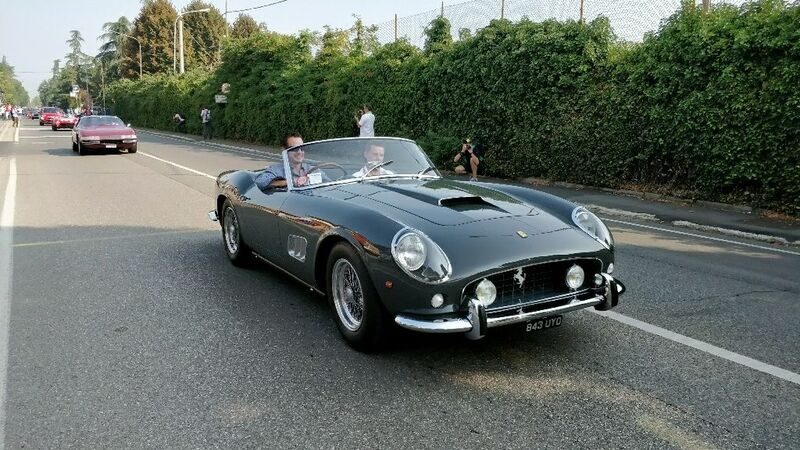 On Saturday morning, September 10, we were on the Via Abetone Inferiore, in Maranello, which passes in front of the historic entrance of the factory Ferrari, to enjoy the parade of the 120 Ferrari participating in the contest of elegance. 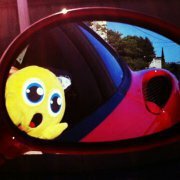 The rally organized by Ferrari with the modern Ferrari did not arrive until late afternoon. This parade was really impressive. I've seen a lot of them, but never as many priceless old Ferraris in a row. Imagine the Mille Miglia whose all cars would be uniquely Ferrari. Huge ! All in an excited atmosphere, with lots of spotters filming and taking pictures. There are people, but not too many. You can see the Ferraris, who pass twice in the street. Saturday morning, these 120 Ferrari of the contest of elegance then leave for Modena. We return to the hotel to take our Ferrari. Fortunately, the hotel is located only 200 meters from the historic entrance of the Ferrari factory and we are quickly in our Ferrari. It was our turn to parade in convoy in Maranello, which means that we find ourselves on many videos and photos of spotters. A few seconds of glory ... but it is always a pleasure to be in a video about such an event. We arrive in Modena at the same time as the convoy of the 120 Ferrari of the contest of elegance because we took the fast lane. The police and organizers force us to follow the 120 Ferrari convoy. It's always a pleasure to be at the heart of the party! At the Ferrari Museum in Modena, we arrive when the 120 Ferrari parade has just passed, which frees us some parking spaces just at the right time. We are then very close to the place of the Military Academy where all the Ferrari of the concours of elegance are exposed. We cross a park and we are there, just in time to see the latest Ferrari arrive, in an atmosphere worthy of the Mille Miglia in Brescia. The Ferrari gently crack the crowd and amazed. On the square, many people hurry to admire the Ferrari under a great sun. After seeing these Ferrari in motion, it's time to detail them at the stop. As always, when we return after the lunch break, there are far fewer people around the Ferrari. This is the perfect time to photograph them. But we are in a hurry! 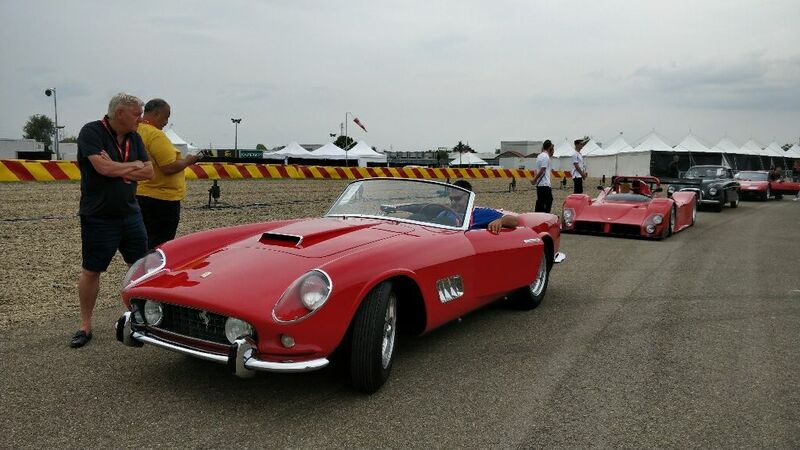 We had information that we, as owners of Ferrari, could withdraw accreditations to participate in the festivities of the 70 years of Ferrari on the circuit of Fiorano. Unbelievable ! It would be enough to provide the gray card of our car and two pieces of ID to get the pass for the owner and a companion. 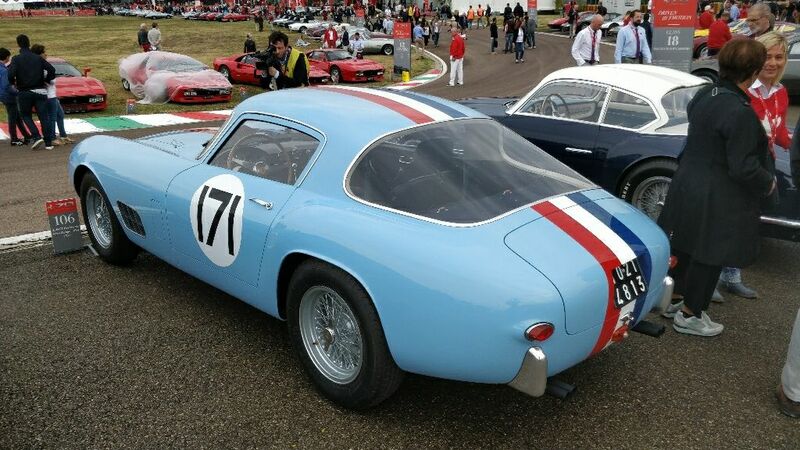 However Ferrari had disseminated the information that this would only be possible for owners registered for the rally and billed between 4 and 5,000 euros. Ferrari even asked the owners not to come tp this event if not registered for the rally. 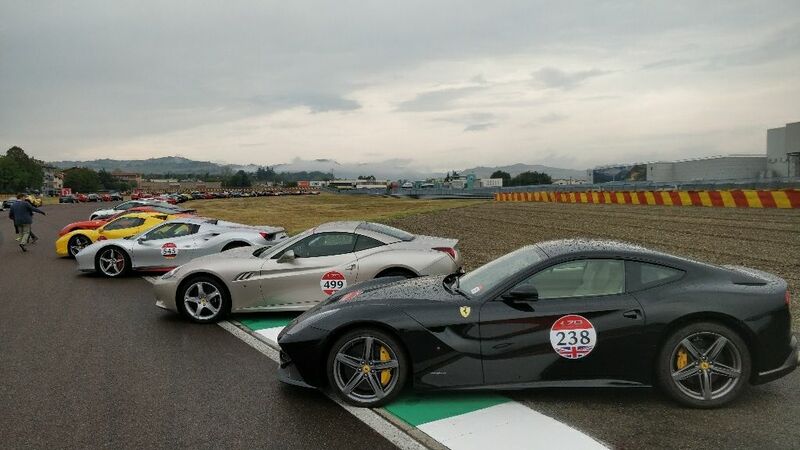 We want to go quickly to the Ferrari Museum in Maranello where the accreditations are provided, in case the number of places is limited or if this possibility is reduced to a few hours. On the spot, not everyone gets easy accreditation. It depends on the person behind the wicket, the speech held, the number of people, etc. But in the end, almost all the members of Ferrarista present manage to get their pass! With our accreditations, we change our program to make the most of this opportunity. Let's go to the circuit of Fiorano where the festivities have started. Starting with the auction. An enormous open-air theater was mounted for the occasion at the edge of the circuit. Sales follow one another, filmed for live broadcast. Prices are high for some models. Others create the show, as when the Ferrari 333SP is on the podium. What a 12-cylinder sound! Many big booths have been mounted on this side of the track: an open-bar to quench your thirst, sponsor booths presenting their products and offering goodies, a booth of presentation of the all-new Ferrari Portofino, showing the rest of the Ferrari range, whose doors are open to you, etc. In the middle are exhibited by class, the 120 Ferrari of the concours of elegance. That's wonderful. On the second part of the circuit, the 500 Ferrari of the rally park as they arrive. The crowd jubilant before the entrance of the circuit asks them to roar the engine of their Ferrari. On Saturday night, Ferrarista created the event in the event with a dinner in the heart of Maranello. It brought together some fifty members in the best restaurant in the region, according to TripAdvisor: @Titof, @Stradale V8, @grhum, @Red and hot, @Boz352, @chris38, @Vincent993, @Calif38, @LINO27, @JMM91, @Zaz, @VIF ECLAIR, @nico170781, @EZ98, @bernwizard, @super_goozy, @308gt4, @ppi.sud77, @Dulabourd, @antorzr,@golfeur77, @Trois cinquante cinq and their accompanying persons. 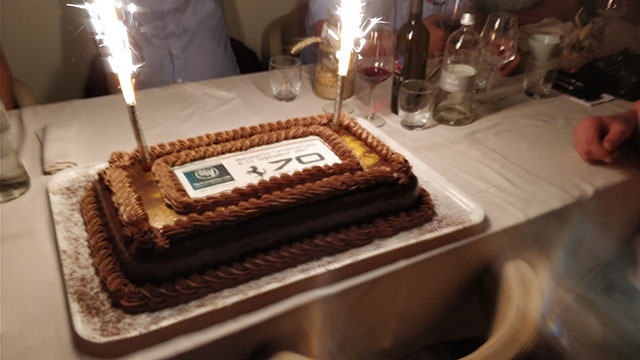 It is the occasion to put heads on pseudonyms and to blow the candles of the 70 years of Ferrari and the 10 years of Ferrarista in a very good atmosphere. A birthday cake was even planned, giving us the opportunity to all sing together! 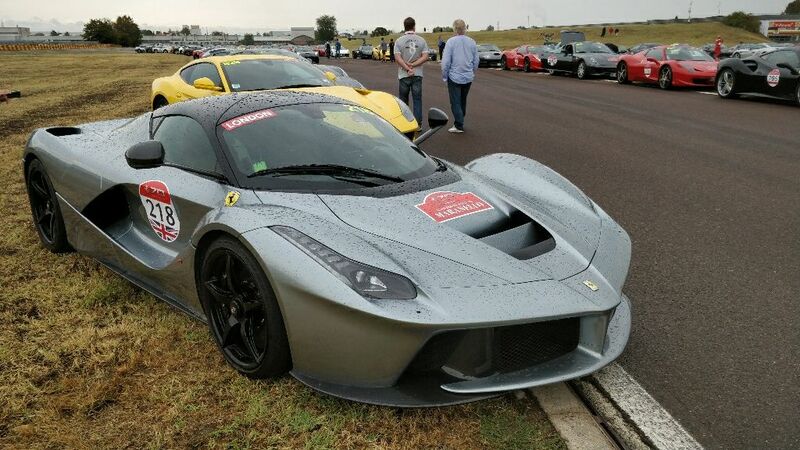 The restaurant was excellent and the pouring rain, with many flashes, dissuaded the majority to continue the evening at the Ferrari show in Fiorano. It was broadcast on TV on the Rai. Jamiroquai, a great Ferrari enthusiast, sang 5 songs at the end of the show. 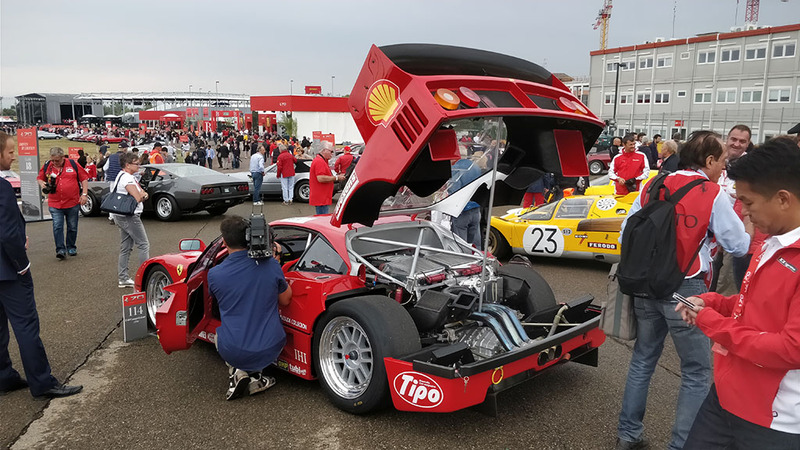 Back in Fiorano on Sunday morning, we take the opportunity to see the 500 Ferrari from the rally that arrived the day before. They put the atmosphere in the street accessing Fiorano the day before, to the delight of the Tifosi who do not have access to the festivities at Fiorano. 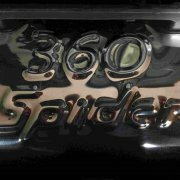 Of the 500 Ferrari, 95% are modern: several LaFerrari, dozens of Ferrari F12 TDF, many of the 350 Ferrari "tailor made" produced for the 70th bityhday of Ferrari, Ferrari 488, 458 Speciale, ... Extremely rare were the Ferrari 308/328/348 / F355 or the Testarossa / 512TR. But when you are passionate about Ferrari, it's a dream to detail all these cars, according to their combinations of colors and options, that give you ideas. 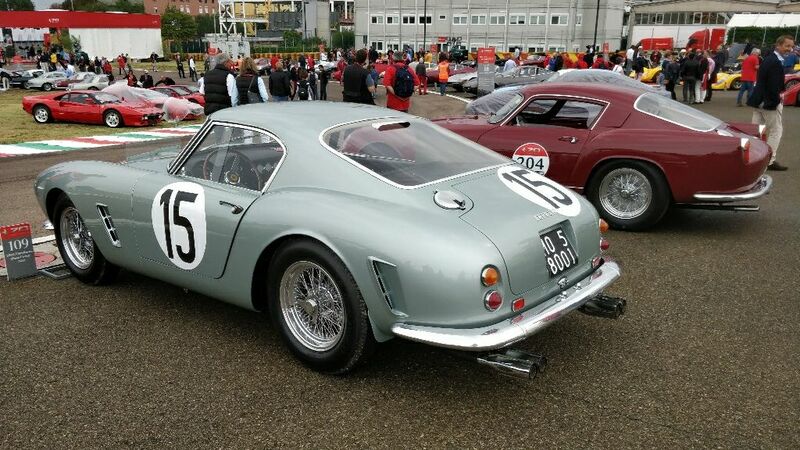 Two members of Ferrarista who participated in the rally tell us that the roads, with Ferrari everywhere, were magnificent, and that the hotels and restaurants were very good. Two problems were reported. 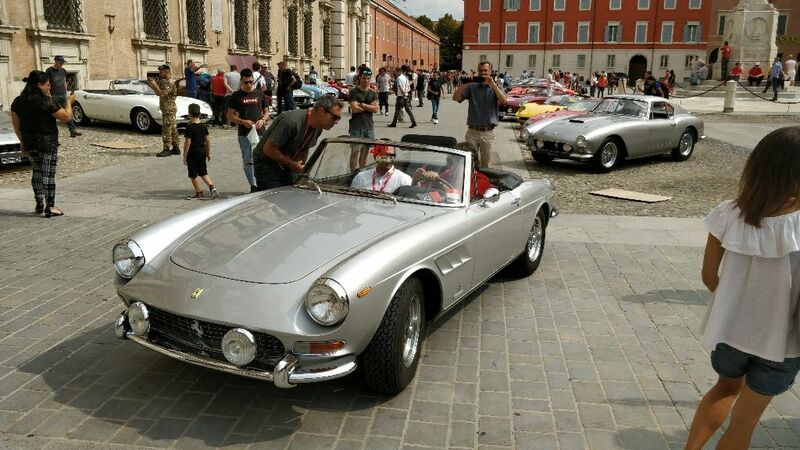 First of all, the roadbook provided stopped at Parma, so they did not know how to get to Maranello. 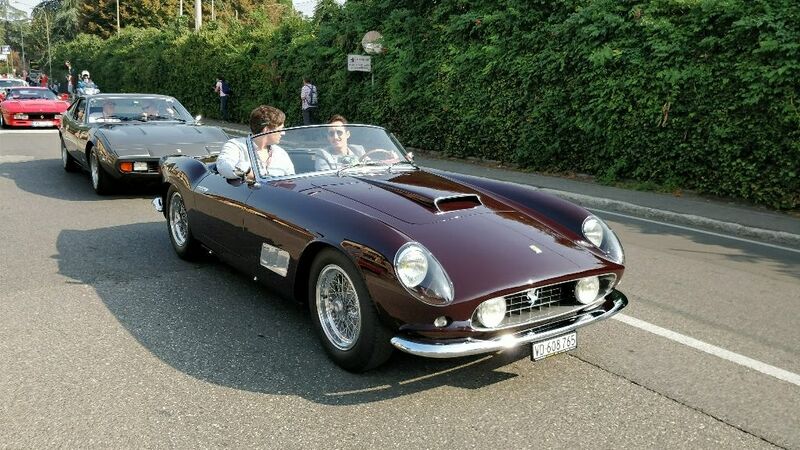 That's why they arrived in scattered order and that there was no parade of the 500 Ferrari of the rally in Maranello. Too bad for the tifosi. 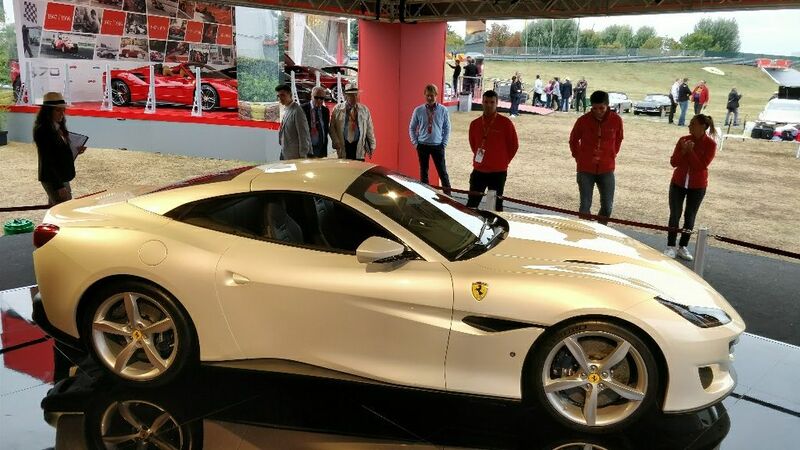 Then the Ferrari were to stay in Fiorano on Saturday night and the owners were brought by bus to their hotel in Parma, more than an hour's drive. It's long. Not being certain we could participate in much of the festivities for the 70th anniversary, we had booked a number of visits to factories and museums. We were thus assured not to make the trip for nothing. We visited the manufacture of Hublot watches, on our way to Maranello. 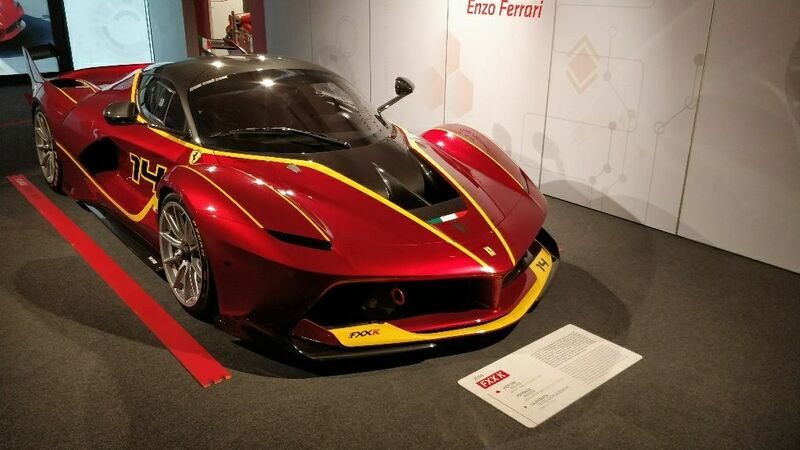 Then the Maserati factory, the Pagani factory and museum, the Ferrari concession in Modena, the Maserati collection in Panini, the Ferrari museum in Modena, the Lamborghini museum in Sant'Agata Bolognese, the Scaglietti coachbuilder and the Ferrari factory, as well as the Ferrari Museum in Maranello. 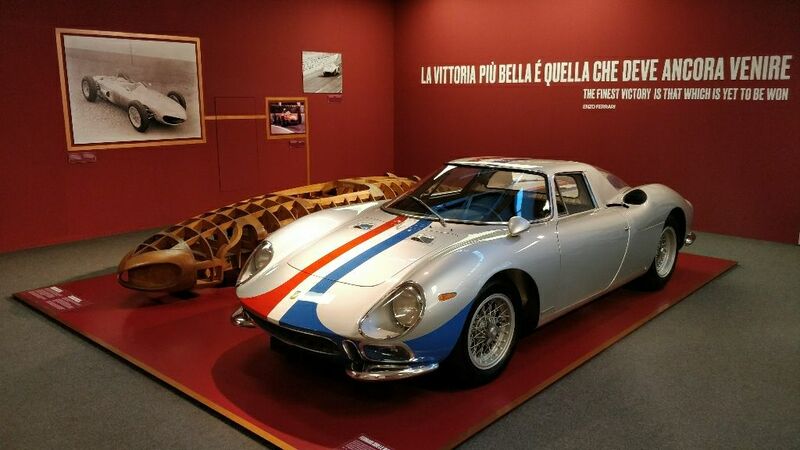 This makes you a relatively busy schedule, in which you do not get bored, interspersed with meals in excellent restorants related to Ferrari's history. 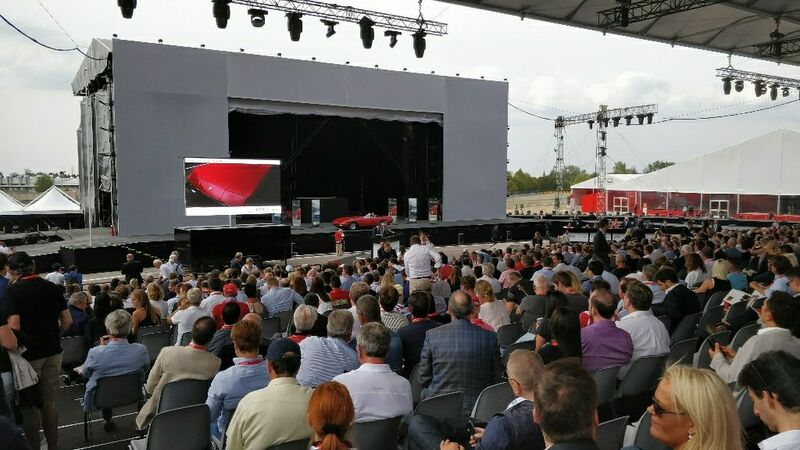 Were you present at Ferrari's 70th birthday in Maranello? What did you remember? What did you prefer? Je n'étais pas présent aux 70 ans à Maranello mais toutes les photos postées dans les 2 articles ad-hoc du forum nous ont permis de vivre cet anniversaire à distance. Des vidéos sont également en ligne sur YouTube et nous distillent l'ambiance qui régnait dans la région. Vivement les 75 ans de notre marque préférée. Merci jfl pour ce commentaire ! L'objectif était effectivement de faire vivre du mieux possible à ceux qui n'ont pu venir cet événement exceptionnel. 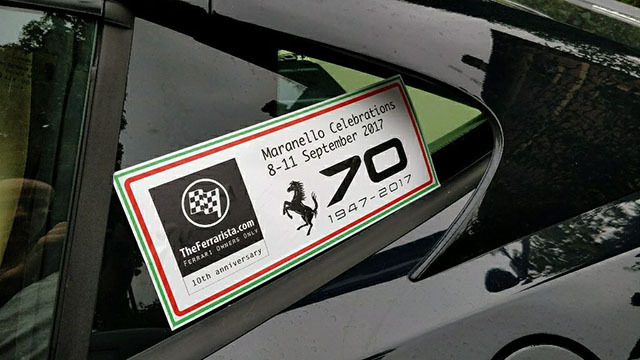 Espérons que l'idée de fêter les 75 ans de Ferrari soit retenue à Maranello, pour remettre cela au plus tôt. c’était un rêve éveillé ce voyage ..
mon moment préféré : fouler fiorano du pied et profiter du show room a ciel ouvert ou on trouvait toutes les combinaisons possible de féfé. quelle chance nous avons d'en posséder une ! ces petits moments donnent une saveur particulière a ce voyage ferrarista je pense . il restera très différent des autres . Merci Grhum pour ton long commentaire, mes préférés. 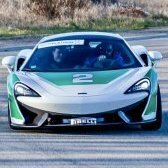 Effectivement beaucoup de moments uniques dans ce voyage à Maranello, comme l'accès à Fiorano, le pass pour participer aux 70 ans, les centaines de Ferrari présentes, le dîner Ferrarista, le buffet Ferrari de folie, le concours d'élégance, la vente aux enchères, la participation au concours du concours, etc., Etc. Même pour moi qui y vait une à deux fois par an depuis 10 ans, cela restera gravé comme un moment exceptionnel. Que dire de cet événement, juste qu'il fut exceptionnel, et que j'ai vécu un rêve. Jamais, je n'avais vu autant de Ferrari, de tous type,tout âge, et de partout, de ma vie, c'était incroyable. Beaucoup, plein, énormément de très très belles Fefe et de moments privilégiés durant ce week-end. Quel moment énorme de pénétrer sur le circuit de Fiorano, de visiter l'usine où sont née nos tuture, de voir la conception des châssis chez Squaglietti, d'entendre aboyer un V12, et une F40, d'être des stars surtout à l'arrivé au musée Enzo Ferrari à Modene, d'être entouré de passionnées,... Tous ces moments et encore beaucoup d'autres comme nos soirée restaurant, l'arrivee du rallye avec cette ambiance, ou aussi l'hôtel en plein coeur de ces 70 ans...resterontont des moments émotionnellement très intense et il est Très difficile d'en parler ou d'écrire ce que nous avons ressenti, il fallait vraiment le vivre. Pour un passionné de Ferrari depuis, oula! déjà quelques années, ce fut vraiment magique. Je teminerais par un grand merci à tous les membres de Ferrarista avec qui nous avons passé ma femme et moi un super week-end. Et aussi merci au chef d'orchestre, toi Franck qui nous a permis de vivre un voyage inoubliable. Top ton commentaire chris38 ! Content que ce voyage t'ait autant plu. Un voyage réussi, c'est aussi un bon groupe, avec une belle ambiance, malgré les changements de programme, liés à l'accès aux festivités des 70 ans.